His kondi playing is brilliant, rippling across the metal tines of the instrument with breathtaking ease. Sorie Kondi’s life is a vision of the struggles of many people in Africa, and specifically Sierra Leone, and there’s no doubt that these harsh struggles have formed him into a prodigious musical talent… but there’s another story here as well. Kondi’s life is also a vision of the rebirth of Sierra Leonean culture and art, the rise of Africa as a world power in the 21st century. Born blind in the Sierra Leone village of Mangiloko, Sorie Kondi turned to music at a young age, teaching himself to play the nearly vanished traditional lamellophone (thumb piano) of his home region, known as the kondi. Living in one of the poorest countries in the world, Kondi was unable to attend school, so he threw himself into his instrument, using his new musical abilities to play ceremonies and weddings outside his village. Sierra Leone’s bitter civil war, fought during the 1990s, forced Kondi to move to the capital of Freetown in 1996. There he took the name Sorie Kondi, after his instrument, and adapted the kondi for his compelling street performances, adding homemade amplification and speakers inspired by his need to be heard over the sounds of Freetown’s busy markets. Composing new songs and developing a powerful performance style, Kondi began to get noticed on the streets of Freetown, though he still lived in a ramshackle house on the edge of a cliff. When rebels sacked the city in 1999, Kondi was forced to hide in his house after everyone had fled while Freetown burned all around him. Even his plans for a recording career were destroyed by the civil war when his manager fled the country and his master tapes were destroyed. From this period of hardship, the bitter song “Without Money No Family” became his anthem. Ironically, this same song would become his triumph and the invitation for him to travel abroad to the US for the first time in his life. A chance meeting in 2006 with American recording engineer Luke Wasserman on the street led to Sorie Kondi’s music being recorded and spread throughout Sierra Leone. He soon became a household name in his home country. In 2011, independent filmmaker Banker White, who had co-directed the acclaimed documentary on Sierra Leone’s Refugee All-Stars, brought Kondi’s music video for “Without Money No Family” to New York-based DJ and producer Chief Boima (himself of Sierra Leonean descent). Boima fell hard for Kondi’s haunting vocals, biting lyrics, and beautiful kondi playing and knew he had to remix the song. His cutting-edge remix in turn led to Boima bringing Kondi to the States for a triumphant East Coast tour in 2012. Now in 2013, Sorie Kondi’s star has risen and will rise even higher. Sorie’s new album, Thogolobea, was digitally released by Boima’s label Dutty Artz in the United States in March 2013. This is in anticipation of a full-length album coming in Fall 2013 that will be produced by Chief Boima. For now, Thogolobea is the perfect introduction to Sorie Kondi’s music. His kondi playing is brilliant, rippling across the metal tines of the instrument with breathtaking ease. 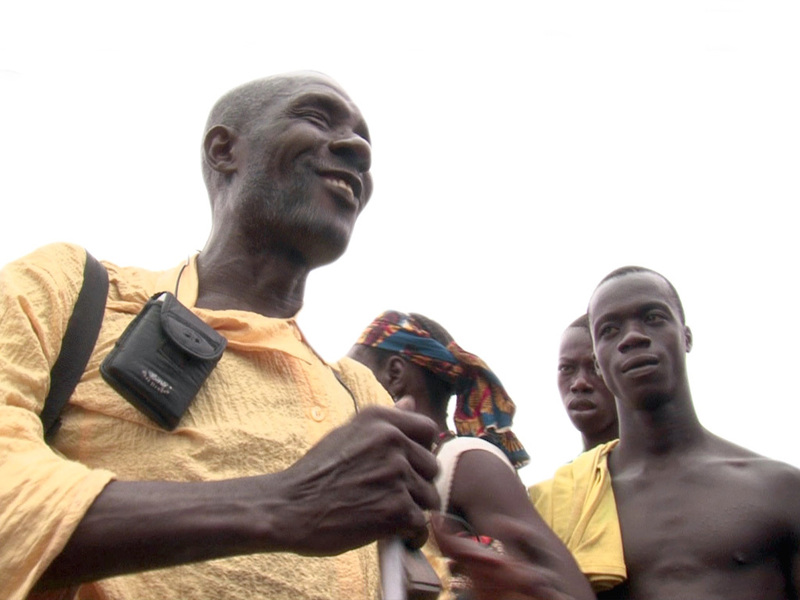 His voice is rough, ground from the streets of Freetown, but capable of soaring flights and beautiful reverberations. His songs speak of his unique struggles as a blind virtuoso living on the street. But there are new sounds here as well, brought by the album’s Freetown producer Fadie Conteh. Autotune and digital recording technology has spread throughout West Africa and taken root in the music of everyone from Saharan nomads to Malian kora players. Thogolobea echoes with the 21st century clash of digital autotuning, thumping bass, and the ancient sounds of Kondi’s traditional instrument. Recorded in Freetown, Thogolobea is a triumphant return to the studio by one of Sierra Leone’s most visionary artists. So much of Kondi’s life can be seen as a parable for Africa’s transition to a new century. It’s the story of how one man built his music from the ruins of the society that surrounded him, shaped a place for himself in an overloaded metropolis by the sheer power of his talent and ability, then took his music across the ocean, buoyed by the digital currents that flow between our worlds.